Both Gelfand and Aronian ended on 5.5 points and Anand was sole third at the time of winning with five points in all. After a shocking first-round loss, it was a good comeback by Anand who started winning only in the fifth round of the tournament. 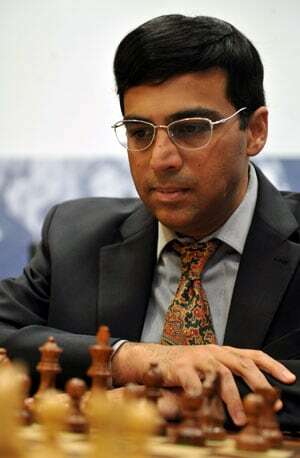 World champion Viswanathan Anand played out a draw with Boris Gelfand of Israel in the ninth and final round to finish third in the Alekhine memorial chess tournament here. Playing the black side of a Semi-Slav, Anand got nothing to push for as Gelfand played solidly for one of his best performance ever. The Israeli ended as joint first along with Levon Aronian of Armenia who defeated Maxime Vachier-Lagraev of France in his final game. In other games of the day, Nikita Vituigov of Russia mishandled a promising position and drew with Ding Liren of China while another Russian, Peter Svidler, shared a point with Laurent Fressinet of France. World number three Vladimir Kramnik was still pressing for a victory against Michael Adams of England and though the result will not have much implication for the winners, Adams can finish joint third if he pulls off a draw. Both Gelfand and Aronian ended on 5.5 points and Anand is sole third as of now with five points in all. After a shocking first-round loss, it was a good comeback by Anand who started winning only in the fifth round of the tournament. For the records, the Indian ace won two, lost one and drew the remaining seven games. Anand went for a similar variation he had employed against Vachier-Lagraev in one of the earlier rounds and did not face problems as Gelfand was also content with a peaceful result. The Israel pressed for some time but could not make any progress with Anand going for piece trading in a heap. The players soon arrived at a drawn endgame where the draw was agreed to after 40 moves. Vachier-Lagraev ran completely out of luck in the last round too. Having lost the penultimate game to Nikita Vituigov, the French Grandmaster has lost his lead and ran into a spirited Aronian, who handled the intricacies of a Grunfeld in masterly fashion. It was a long theoretical duel wherein Aronian manoeuvred his forces well to reach a better endgame, calculated precisely and won an exchange after which the victory was imminent. Boris Gelfand (Isr, 5.5) drew with V Anand (Ind, 5); Levon Aronian (Arm, 5.5) beat Maxime Vachier-Lagraev (Fra, 4.5); Peter Svidler (Rus, 3) drew with Laurent Fressinet (Fra, 4.5); Nikita Vituigov (Rus, 4.5) drew with Ding Liren (Chn, 3.5); Michael Adams (Eng, 4.5) playing Vladimir Kramnik (Rus, 3.5).